Dinnertime is always hectic here with four boys running around, just as it is at households all around the country I am sure. Everyone seems to want something right as I am getting ready to make dinner, patience is running thin and we always seem to have an event to run off too. What is a mom to do? How can you keep up with the pace, cook a quick meal that you can be proud of and is sure to please everyone? 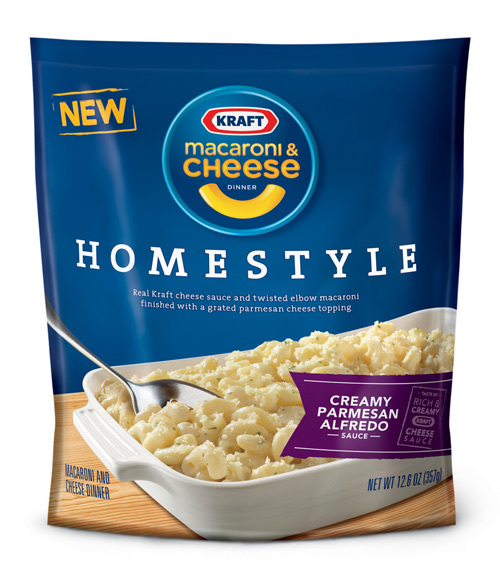 With the new Kraft Homestyle Macaroni and Cheese Dinner line, you can create a delicious dish in only 20 minutes, that tastes just like made from scratch macaroni and cheese. What's even better? It is now available in a Creamy Parmesan Alfredo flavor! "Your wish has come true: that homemade, cheesy taste of oven-baked Mac and Cheese is now easier to make than ever. Gooey, cheesy goodness topped with golden brown bread crumbs is just minutes away from your mouth. A show-stopping dinner spectacular your family will love and neighbors will envy. And oh yeah, there are three different delectable versions. So there's something for everyone to love"
I was given a bag of the new Creamy Parmesan Alfredo Homestyle Macaroni and Cheese to try out. I had tried the other flavors in the past and had always enjoyed them, but I was chomping at the bit to give this new creamy flavor a shot. We made ours with BBQ chicken from the grill one night. There is nothing that could be easier about making this dish. All you have to do is boil the macaroni on the stove as you normally would, mix together the other ingredients, place it in a baking dish and then add the topping before baking. Easy as pie. I love that this macaroni and cheese really tastes like homemade. All my children will eat it. The cooking process is simple and easy to follow, even when you are rushed for time. The price is good for a side dish and likely costs less than buying the ingredients for made from scratch. There are three flavors available, so there is something for every meal. Classic Cheddar, Hearty Four Cheese and new Creamy Parmesan Alfredo. Recipes are simple, you can easily add in ingredients to make tons of different dishes. One bag is not necessarily enough to feed all six people in my family. This is normal for most side dishes though, so I just buy two packages and we are good to go. You do dirty two dishes making this meal, but you would likely use the same amount making it from scratch, so it's really not a problem. I wish there was more topping, but I added some of my own with bread crumbs and Parmesan cheese. Kraft Homestyle Macaroni and Cheese Dinners can be purchased at your local supermarket stores. I have yet to find one that doesn't carry them. You can use the product locator to locate the closest store and then get a coupon for $.50 off to try Homestyle Macaroni and Cheese for yourself. I try to make meal time the time when we focus on family and each other. With everyone's busy schedule, we all have to eat which makes it the perfect time. I try to get everything done/all chores while everyone else is out of the house so I'll have time for listening. When my 7 were younger I would make casseroles for the week and freeze them. This way when dinnertime came around we only had to slip it in the oven. It gave me lots of time to talk with the kids while setting the table and waiting for dinner to cook.I learned about their day in school and it was relaxing by the time we sat to eat. Google reader follower under Caroluci47. Family cooking lessons! We do it a couple of times a week. I get help in the kitchen, my son learns how to cook healthy meals, and we get to spend extra time together as a family. I try to make eating together fun by making different foods and sometimes themes with them. Following Life With 4 Boys publicly on Google Friend Connect. Dinner time is the most consistent daily family time. A time to talk and rehash the day. We try to eat dinner together every night. At this stage (I am retired), it is not so much me making time for them, but them making time for me--which is to be expected because of the normal change in dynamics. Mandatory - My favorite secret is to take a shower at night! Everyone is asleep, and it adds another 30 minutes on to my day with my family! We do chores together - sounds stupid but it is family time :) Thanks! I like you on FB! Aleksandra n.
I make time for my family by doing my housework chores on my lunch break or after the kids go to bed. I make sure that there is nothing that is going to distract my attention during family time so that I can give all my attention to the family. I also make sure that family time is not forced but rather enjoyable and something everyone wants to do. Thanks for the giveaway! I'm an RSS google reader subscriber, thanks! I entered your Chilis Triple Dipper giveaway, thanks! I entered your Necessary Roughness giveaway, thanks! I incorporate the kiddos into everything I do! 3. Follow Life With 4 Boys on Twitter. Great giveaway! I love making time for my family by having nightly dinners together! Even when my husband is working I try to make him dinner and bring it up to his job! Thanks for the opportunity to win! I Followed Life With 4 Boys publicly on Google Friend Connect. I Followed Life With 4 Boys on Twitter. I Subscribed by email and RSS feed. My favorite secret is simply scheduling out to dinner nights with my son. I've found that if we're out, there's no distractions of wanting to go hang with his friends, or anything like that. My favorite secret for making time for family is to pick things that everyone loves-then it's easy to get everyone together! My favorite secret for making time is knowing that it is okay to decline invites to things if you need to just spend some time at home with each other.